Alex: Oh Switzerland… From your cute little puppies to fresh cheeses, ridiculously beautiful watches, breathtaking views and gorgeous woman…you truly won my heart. My time in the town of Lucerne was sadly short lived, staying only for 2 nights but I made it my mission to fit in as much as I could. Day 1 involved climbing the 2,128 m high summit of Mount Pilatus. The mountain offered Panoramic views of Central Switzerland but unfortunately there was no snow to be found! It was still freezing cold up there yet I felt as though the sun was burning my eyeballs! I’d be lying if I said I wasn’t almost quietly having panic attacks as we were climbing the summit with these Gondolas. 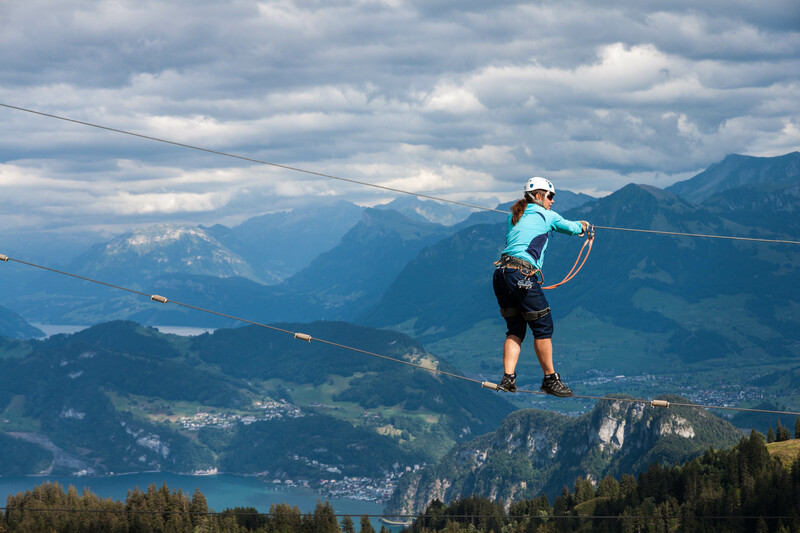 Mount Pilatus offers various activities including Toboggan tracks and one of the biggest suspension rope parks in Switzerland! Check out this Crazy cat! View from the top of Mount Pilatus. Notice the church on the bottom left. The night turned into a blur I’m not going to lie so we’ll skip along and ta da! Cue next day. The town of Lucerne is packed with fresh fruit markets and vibrant flowers that line the balconies and lamp posts. Unlike other tourist hot spots it was evident that the locals of the town came into Lucerne to do all of there shopping whether it be food and so on. One of many fruit stalls. I have an odd obsession with sunflowers so I’m pretty sure it’s safe to say that for a good half an hour I was standing at this one stall taking photos. Can you blame me though!? Sunflowers and cheese. It was like I died and went to heaven. -Strawberry and dark chocolate mousse, covered in strawberry chocolate with a strawberry wafer base. -Salted Caramel covered in Milk chocolate with crispy wafer base. Myself and my friends were on the hunt for some traditional Rosti. I did my best to steer clear of all the touristy hotspots and managed to find a gem that was literally in a little crevice of a corner a few streets back from the main path. Switzerland was the worst in terms of carb overload. The rosti is pretty much only consisting of potatoes. Add a fried egg, add some cheese and some carrots, add some more fried potatoes and chk chk BOOM! You have this monster. But wait, as if the potatoes we got weren’t enough, we thought it would be a good idea to order some more potatoes but this time covered in cheese and Paprika. But…the heavens opened and I finally was able to try a proper Swiss Fondue. This was definitely a purge worthy moment and I’m almost 100% certain that we all looked like gluttonous pigs, but surely we could’ve been forgiven? We’re on holidays! The bread’s crust remained crisped even though it was covered in hot melted cheese. The cheese fondue consisted of a white wine base with some herbs and a ridiculous amount of cheese. We attempted to walk around the town for a little bit longer after our late lunch but we really didn’t last long so we caught a taxi back to our hotel. So Switzerland definitely delivered the goods. It’s a shame I wasn’t there long enough, but only gives me more of a reason to return. What an exciting city so much to do & see, how courageous is that crazy cat on the wires so high up, she’a a legend. This makes me miss Switz so much!